Apparently Voodoo is a big deal, especially with tourists in New Orleans. Like many others I pictured dolls with pins stuck in them and necklaces with chicken bones. When I started researching this set of spiritual beliefs or religion if you will, I became fascinated with the culmination of its history. I also found some cool stuff to do when we finally arrive in Louisiana. It would be impossible to fit all of the history in here, but I'll try to hit my favorite highlights. Louisiana Voodoo is an amalgamation of religions. Influences from West African slaves, French Catholicism, European mysticism, Free Masonry, Native Americans, Wiccans, and Islam formed what is today's underground worship of spirits. It is worshipped underground because it scares people. Hollywood formed some unfortunate assumptions and perceptions that so many have of Voudouists. Voudouists believe in a God named Bonye or "Bo". They do not believe that this God is knowable, but instead is distant, having nothing to do with human affairs. Spirits called Loa are worshipped with the belief that the dead can have influence over the living. Spooky! Legba is a spirit who is also known as St. Peter, who is believed to hold the keys to heaven. Voodoo leaders have historically been women. Throw your hands up ladies!! These powerful females were called Voodoo Queens. One of the most celebrated was and is Marie Laveau, who ruled in the 1830s. Her tomb still draws more tourists each year than Elvis's. So, we'll be paying her a visit, but only after I read the book "Marie Laveau of New Orleans" by Charles Gandolfo. People visit her asking for happiness or wealth and then drop by the statue of St. Expedite to hurry their wishes along by leaving a poundcake as an offering. Apparently it is common for gamblers to yell Marie's name when rolling the dice. Voodoo used to really freak me out and now I know who to thank for that, Hollywood. The corrupt perception of Voodoo started in 1932 with a film called White Zombie. The juju and hoodoo superstitiously thought of as amulets and spells used for witchcraft aren't as evil as the movies would make you believe. 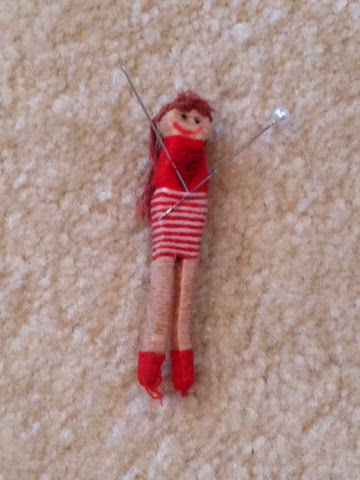 It surprised me to learn that voodoo dolls were actually used to bring blessings and the pins were used to hold pictures on the dolls, not to bring harm. The fear of Voodoo really can be traced back to the Haitian Revolution of 1791. The religion is frequently and incorrectly linked with Satanism. Of course, there are some funky and scary practices that do go along with the beliefs. I am NOT saying it is okay to cut the head off of a chicken as a sacrificial act. I do hope that most believers or followers of Voodoo just want happiness and good fortune like everyone else. The significant link with Catholicism is also under emphasized. The philanthropic nature of many of the Voodoo Queens and their dedication to Christianity is well documented. The Historic Voodoo Museum will definitely be a tourist stop for us, as I want to learn more. The most exciting Voodoo tourist attraction has to be the Voodoo Experience! It is a 3 day music festival with over 2000 artists performing around Halloween!!! Here are a few that were in last year's line-up: Pearl Jam, Rage Against the Machine, 311, R.E.M., Eminem, Red Hot Chili Peppers, and SO MUCH JAZZ! It's been happening for 15 years and I'm just learning about it now? Way to miss the boat Kelly. I hope I can con some people into joining me this year. I promise I won't put a spell on you, or will I? There is certainly much, much more to learn about Voodoo. There are books on hold at the library for me to devour. I look forward to my first visits into this weirdo history soon.